The government granted a new batch of oil and gas exploration licences today – including one in south east Surrey. 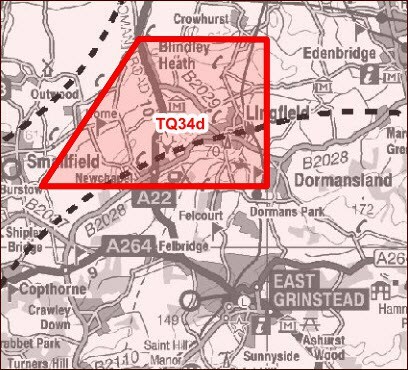 Igas (Island Gas Ltd) now has a licence to explore for petroleum in block TQ34d, which is around Lingfield. The new licensed areas add to those already licensed, including a batch of blocks that were made available in August. Altogether, an additional 2.8 million acres of the UK have been made available for oil and gas exploration this year. The licences – known as PEDLs (Petroleum Exploration and Development Licences) – give their holders exclusive rights to search and bore for petroleum in that block. However they don’t grant permission to do so – that is the responsibility of the relevant Local Authority (Surrey County Council in our case). Igas has submitted a planning application for the production of Compressed Natural Gas (CNG) and electricity at the Albury Park Wellsite, East of New Road, Albury. Local resident Dr Damien Short has objected on grounds of air pollution and emissions, traffic and transportation. Read his objection here. The government is consulting on changing the costs rules on environmental legal cases, making it very financially risky for communities to bring judicial reviews. The caps which restrict the amount individuals and communities are liable to pay are proposed to double, and you won’t find out whether your costs are eligible for capping or what the cap will be until you are much further through the process and already committed to bringing the case. The Environment Agency has issued a Mineral Waste Variation Permit – Permit number: EPR/BB3300XG/V003 – to allow Horse Hill Development Ltd (HHDL) to carry out flow testing at Horse Hill. No new drilling will take place at this stage (the exploratory well was drilled in late 2014). And there will be no flaring. HHDL still needs other regulatory approvals from the Health and Safety Executive and Oil and Gas Authority. But they are one step closer. How ironic that they got this permit on the day the UN climate summit started – and the day after many Surrey residents were marching in London in defence of the climate.